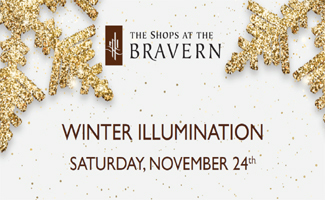 The Bravern is thrilled to announce a special Winter Illumination holiday lighting event on Saturday, November 24 at 6pm to kick off the holiday season. The family-friendly event will showcase the property's new LED, energy-efficient light installations, all custom made in Italy. The lighting fixtures include a custom gift box that will encapsulate the fountain on the 8th street arrival court and feature branded ornaments with the names of tenants and retailers. The gift box light fixture is exclusive to The Shops at The Bravern and will give the property an elegant glow for the holiday season. The festivities will begin promptly at 6pm with a high-energy performance by the Sea Gals. Santa will also make an appearance at the event to spread holiday cheer to children of all ages, making his much-anticipated arrival to The Bravern in a luxury Rolls Royce. The evening will conclude with the official, full-property lighting ceremony of seasonal fixtures and decor. Shops will remain open until 8pm the day of the event for holiday shopping and in-store activations. Join us for a special family-friendly Winter Illumination event and private party from 4:30-6pm leading up to our public lighting ceremony. Private Performance by the Sea Gals. Photos with Santa - Prints complimentarily provided. Holiday Card Writing - Send holiday wishes to friends and families at The Bravern Holiday Card Writing Station. Our experienced calligraphers will assist you to personalize the holiday cards with wax seal and writing holiday wishes with a touch of art. The Bravern will provide and mail out holiday cards. Gingerbread Cookie Making - A unique experience to customize your own gingerbread cookie. Choose up to three shapes to DIY your signature holiday cookies. Holiday Hors D'oeuvres and Beverages - Pamper yourself in the holiday gourmets. 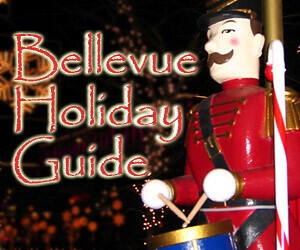 A wide selection of holiday beverages including Hot Spiced Mulled Wine, Warm Bourbon Cider and Hot Chocolate. The Winter Illumination event at The Bravern is free and open to the public. Complimentary 6-hour parking validation at any merchants without spending requirement.